Reminiscent of the fairy tale “Stone Soup,” this modern-day feast can easily accommodate as many guests as you can fit into your home and will likely get cheers from the crowd. 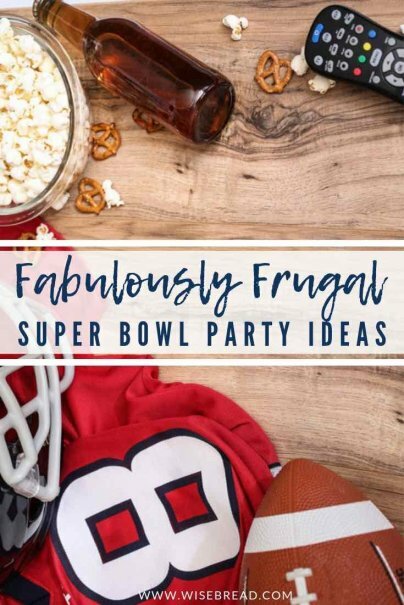 Bjorn Karger, author of The Underground Guide to Living Frugal dishes on the details: “It needs everyone's help to win; just ask everyone if they could bring something to add to the stew. Have a simple broth going — water and a powdered soup-packet will do, or slice up an onion and add a few herbs and oil. Even with a small party of four to six guests you'll be surprised at how much food will come in and how fun it will be.” Ideas for ingredients guests can bring include potatoes, chicken, shrimp, okra, carrots, and even coconut and curry. Sounds like a fun and delicious way to bond! If the idea of a hotel waffle bar gives you tingles, you’ll likely be the type to appreciate a grilled cheese station at your next Super Bowl party. The idea is simple — set up a table with an electric griddle, and lay out an array of unique ingredients to create one-of-a-kind grilled cheese sandwiches. Don’t forget to include five or more varieties of cheese, and remember that the thicker the bread is, the more filling (and affordable) the sandwiches will be. Not a grilled cheese fan? Put a twist on it by offering the same set-up for paninis or even quesadillas. Is asking your guests to bring a side dish or even alcohol acceptable in today’s culture? Most definitely! Will it yield positive results? Not always. As many experts have pointed out, many people interpret the word “potluck” as “stop by the dollar store and pick up a few jumbo-sized bags of chips.” If you’re concerned that guests won’t put effort or creativity into their offerings, assign categories of food to people based on their last name (first letters of A-E bring one item, F-K another type, etc.) In any case, don’t depend on guests to provide the bulk of the food and drink; always have a main course and a substantial amount of non-alcoholic offerings to go around. While most people assume that food will be the most expensive part of the party, drinks and tableware can be even more costly. Wona Miniati, co-author of the popular Cooking With Trader Joe's cookbook series, suggests starting simple where tableware is concerned: “Thrift stores are a great place to pick up one-off pieces. A collection of non-matchy-matchy plates and glasses can be cute and eclectic.” She also likes the idea of serving plain water with a selection of fancier garnishes like fresh citrus fruits, cucumber, or pomegranate seeds. For an affordable spritzer, combine one part juice with one part sparkling water. With less than a week until the Super Bowl, it may be too late to use some of the more extreme tactics of coupon-clipping and ad matching. What tips do you have for making the big game gathering even bigger? I like to make a big pot of chili and ask others to bring toppings (shredded cheese, onions and peppers, sour cream, etc.) and "go-withs," such as tortilla chips and salsa or guacamole; maybe rice or pasta. For family gatherings, we have had each family bring a recipe's worth of a dish, such as chili or sloppy joes, and then thrown it all together into one pot. A relatively inexpensive and popular beverage is spiced apple cider. Pour a gallon or more of apple cider into a kettle on the stove or a crockpot, add whole spices (cinnamon sticks, cloves) and halved or sliced oranges, and heat to steaming. Provide coffee mugs and a ladle and let guests serve themselves. I love the idea of a grilled cheese or panini station. Adding a fresh fruit platter (maybe with melted chocolate fondue?) would be great if you wanted to do something fancy but still affordable. The grilled cheese/panini/quesadilla station was my favorite idea from this article. A cheap superbowl meal that my family always did was hot dogs and sauerkraut and hot dogs - a relatively cheap meal that's ultra filling!